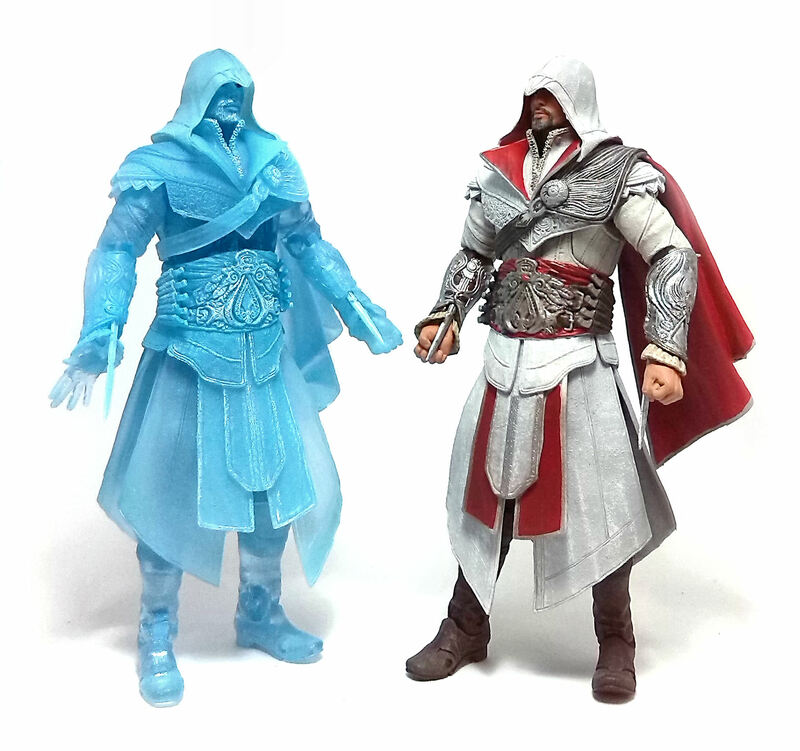 Eagle Vision Ezio uses the exact same molds from his Legendary Assassin version, depicting him wearing a tunic, a short cape with a hood, a tabard, leather pants and heavy riding boots, as well as assorted pieces armor. 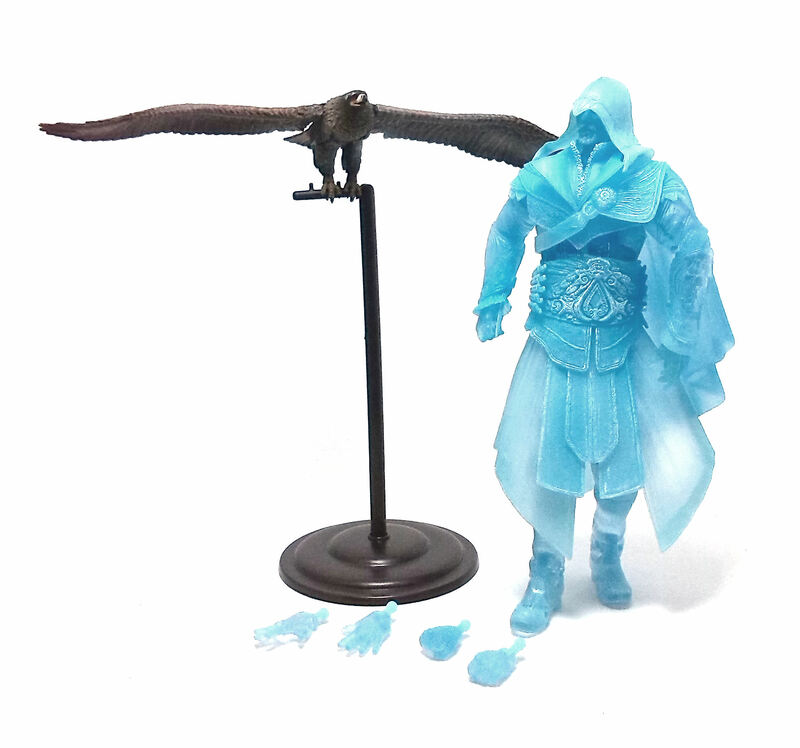 The thing that sets this version apart is that this time around the whole figure was cast in translucent blue plastic to represent the way “Eagle Vision” works in the videogame. The Eagle Vision gimmick inside the game is supposed to have Ezio exerting his “Eagle Sense” in order to give the player a visual aid locating the position of Ezio’s targets or solve simple puzzles. 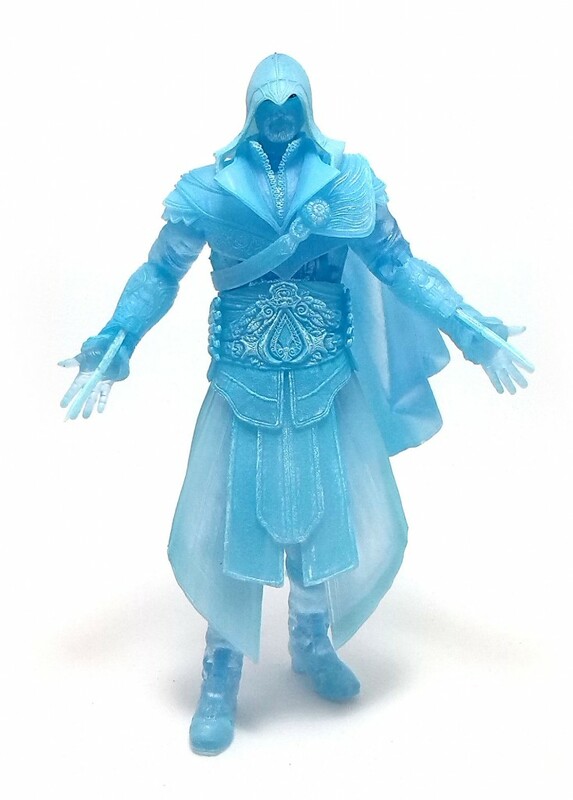 Even though the figure was made in clear blue plastic, NECA still went ahead and added a fair amount of paint operations to spruce up the look of this figure. 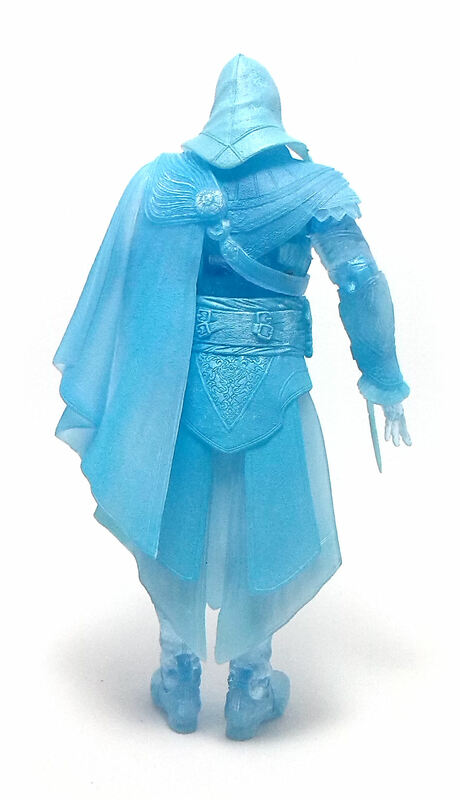 The top of the hood was painted light blue to increase the opacity of the piece, and the textured armor bits show highlights applied in white, producing a frost-like effect. Ezio comes with a couple extra sets of hands but his weaponry is limited to the two hidden blades in his bracers. 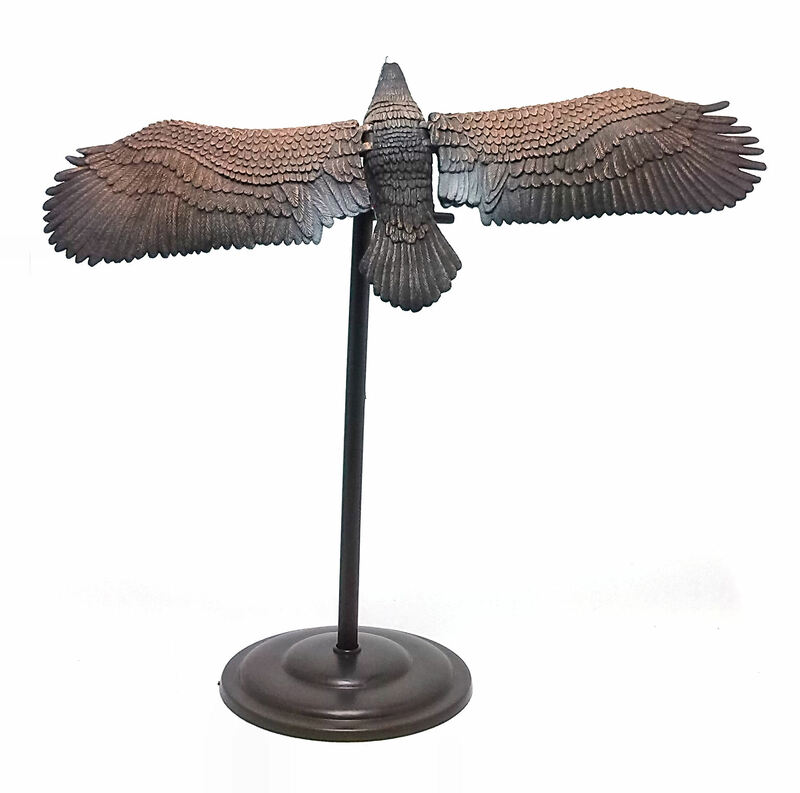 He also comes with a fully colored eagle and a stand for the bird to perch upon. The eagle has articulated wings, and is well painted. It has a couple of peg holes in its claws to affix it to the perch, but the grip of the claws is strong enough to keep the figure up without them. 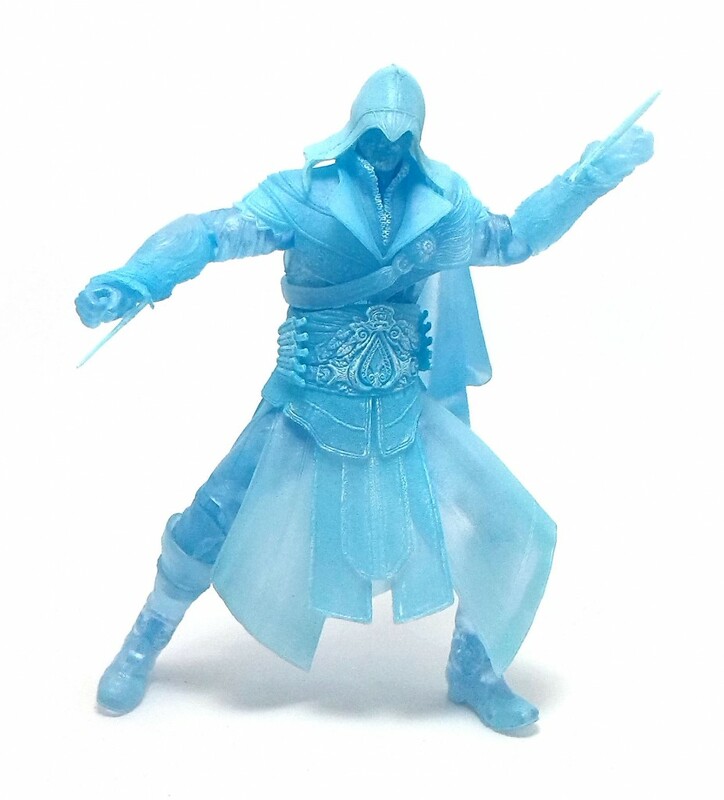 Overall, Eagle Vision Ezio is a nice gimmick figure to have. Not only the color scheme on the main character is quite striking, but also the eagle and its accessory are interesting additions to a display.